New home permit activity was up by nearly 45 percent year-over-year in the Los Angeles-Long Beach-Anaheim metro during the second quarter. According to an index released by BuildZoom and Urban Economics Lab, new home construction activity in the metro has recovered by 65.2 percent since the housing bust. 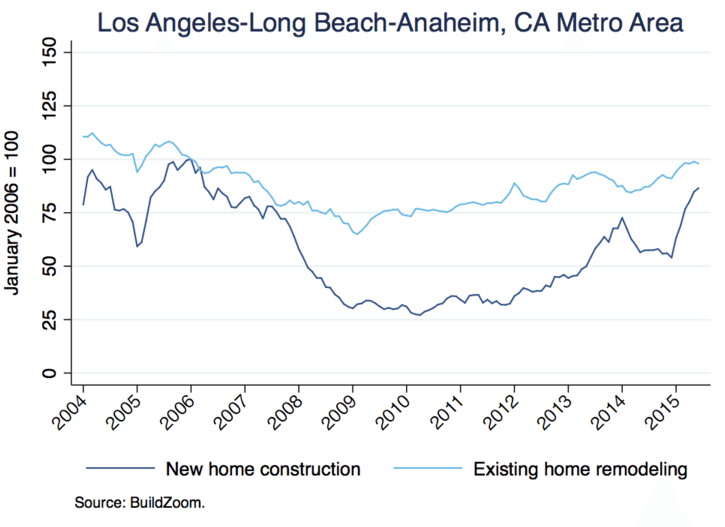 BuildZoom: The Los Angeles metro has recovered from the housing bust by 65.2 percent. With a population of nearly 13 million, the metro includes the cities of Santa Ana, Irvine, Glendale, Huntington Beach and Santa Clarita, along with the three previously mentioned markets. Following the recent merger of Irvine-based Standard Pacific Homes and Ryland, expect the new entity, CalAtlantic Group, to be an active homebuilder in the metro moving forward. Brookfield Residential, Brandywine Homes and Integral Communities should also pull permits for new home developments. Integral is currently proposing a 131-home project at the site of a former scout camp in Long Beach. Similar to the new home construction sector, the metro’s remodeling industry has noticeably recovered from the housing bust by 69.4 percent. Aiding this recovery was the 14.2 percent year-over-year rise in permit activity that occurred during the second quarter. Nationwide new home permit activity rose by 18.7 percent year-over-year during the second quarter, however, the industry is considered to have recovered from the housing bust by only 16.8 percent. What makes Los Angeles such a unique market?